Match-ups will be using the Swiss system. There may be elimination rounds to determine the top final placings, depending on time constraints. Each match-up will be best of 3, with a maximum of 3 games, so a draw is possible. Each player will have just one Stak, 9 cards deep, with 3 cards in hand. As players are using their own decks, each will play using their own supply and scrapheap piles. If a player has no cards left in their supply pile but needs to draw a card, they do not get to draw (the scrapheap is not shuffled back in, as with casual play). Players will roll the provided dice to determine who goes first for each game in the round; that player does not draw a card on their first turn. Gameplay is per the original instructions, additionally using the ‘starting entry effects trigger’ and ‘reactive play’ toggles. During the game, you must keep all of the face-up cards in your Stak visible so that your opponent can make informed decisions; you must also inform them correctly if they ask how many face-down cards you have remaining in your Stak, or how many cards you have in your hand. Each player will need a deck of 60 cards, with exactly 10 of each rank (1 through 6). There can be no more than 5 copies of a specific card (e.g. Core Bot rank 4) and no more than 12 of any one Bot type (e.g. Bash Bot). 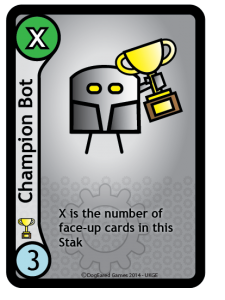 Any cards from the original and expansion packs can be used, with a couple of exceptions: Magnet Bot should not be used (it is only suitable for multiple Staks or 3+ players) and Backer Bot should only be used if the player has sleeved cards as it involves placing cards onto other players Staks, so could lead to confusion. The original and expansion packs would each be suitable to use as they are, or as a good starting point to modify. You will be using your same deck in every round in the tournament, with no card substitutions between rounds or match-ups. Sleeved or unsleeved cards are fine, as long as there are no marks that allow you to distinguish between your cards. Cheating, unsportsmanly conduct, invalid deck composition (eg not having 10 of each rank), or anything else we deem to be unacceptable for such an event. You must be willing to present your deck for inspection by the officials if requested. 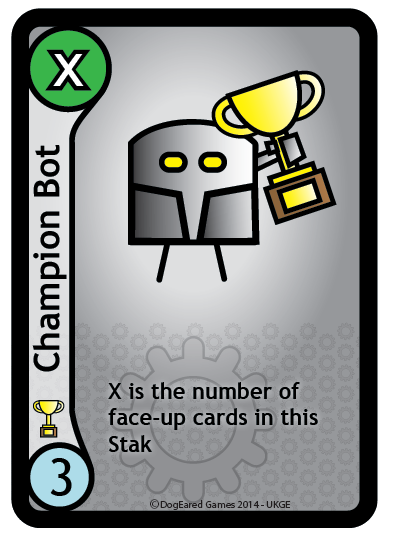 3 sets of Stak Bots, plus an exclusive ‘Champion Bot’ game card that will be available only to tournament winners; there has only currently been one awarded! « UK Games Expo 2014 Tournament and other awesomeness!